The movie Forrest Gump parodies the famous “I’m walking here!” line when Gump pushes Lieutenant Dan’s wheelchair across a crowded Manhattan street. An episode of American Dad! titled “Irregarding Steve” parodies the movie, with Roger the alien as the Rizzo character developing a steadily worsening cough after arriving in New York and Steve eventually donning a cowboy outfit similar to Joe’s. 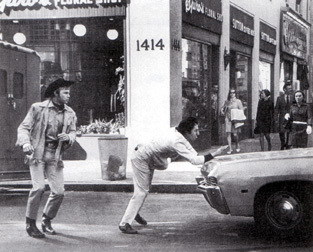 The episode parodies several important scenes from Midnight Cowboy, including the final scene bus ride. The movie “Back to the Future 2” has the Michael J. Fox character (playing his future son) coming out of the diner and almost being hit by a car, yelling “I’m walking here!” at the vehicle as it speeds away. The Futurama episode “Brannigan Begin Again” contains a montage scene based on Midnight Cowboy. After the two characters Zapp Brannigan and Kif (as Joe and Ratso respectively) are discharged from the military, they are trying to survive in the world, including resorting to prostitution. In the video game Grand Theft Auto IV, Vlad is nearly hit by a taxi and he shouts out “Hey! I’m walking here!” during a cutscene. In the comedy film Borat: Cultural Learnings of America for Make Benefit Glorious Nation of Kazakhstan, a montage of shots of Kazakhstani journalist Borat doing various inappropriate things on the streets of New York City is shown with the song “Everybody’s Talkin'” played behind it. In an episode of Flight of the Conchords in which Bret and Jemaine try to become prostitutes, Jemaine tells Bret to wear a cowboy hat to make himself more appealing to women. Later, Bret says “I’m walking here” after a woman rejects Jemaine. 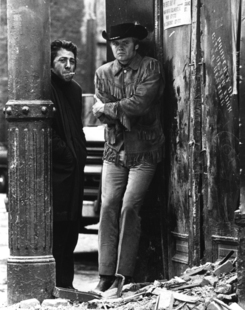 Midnight Cowboy plays NWFF through March 5. Tonight it is introduced by film critic Ted Fry. Posted in Uncategorized | Comments Off on I’m Walkin’ Here! Did you know you can rent NWFF’s cinemas for as little as $50 an hour? Cast and crew screenings, birthday parties, script readings…you name it and I’m sure we’ll let you do it in our cinemas. This one is too big to paste in, so you’ll have to download the whole thing by clicking here. But’s worth it. The Film Quarterly writer definitely had some mixed impressions from Schlesinger’s film, which won 3 Oscars, including Best Film, Best Director, and the equivalent of Best Adapted Screenplay. Birdsong, and Examined Life, two films opening today in New York will make their Seattle premieres April 24th at Northwest Film Forum. “‘Birdsong‘ (‘El Cant dels Ocells‘), a lovely and strange new film by the Catalan director Albert Serra, is less a retelling of the Nativity story than a dream about it, filtered in lovely black and white through a sensibility that recalls Luis Buñuel and Samuel Beckett.” AO Scott in the New York Times. Opens today for a week-long run at Anthology Film Archives in New York. “When Taylor and I met up over coffee in Williamsburg, Brooklyn,” notes Aaron Hillis, introducing his interview for IFC, “we discussed the possibility of chatting in the car in which West was filmed, but it was unfortunately being used to sing in by her husband, Jeff Mangum (reclusive frontman of the influential 90s indie-pop band Neutral Milk Hotel), who also contributed some sounds to the film’s score. Slant is having server problems at the moment, but when it comes back up again, you’ll find a review by Andrew Schenker. “Examined Life” opens at the IFC Center tonight; Taylor will be on hand along with Avital Ronell. Tomorrow night, she’ll be accompanied by Kwame Anthony Appiah and on March 5 by Cornel West. 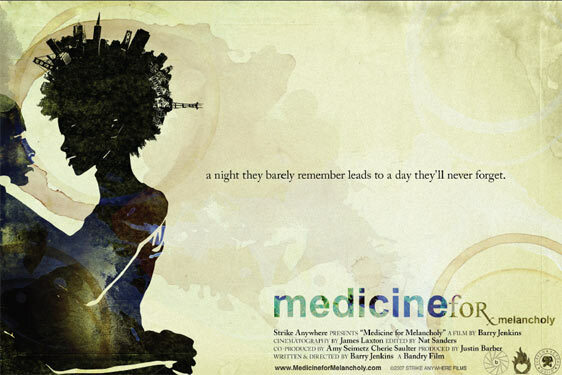 Then the film begins its tour across the country; see the Zeitgeist Films site for cities and dates. 2. No, I did NOT go to the Oscars. I attended the Fox Searchlight simulcast viewing party (for Slumdog and the Wrestler) It was kind of lame tho nice to be losers in a room full of winners. 3. Yes, I did go to the after party at Vanity Fair (the producer of the Wrestler gave me his tickets). Believe it or not, this party is 5 times more glamorous and exclusive than the Oscars are. Tickets will be up soon on Brown Paper tickets, in the meantime, try to make it to one of the screenings while Barry’s in town. Also, a lot of the great music in the film is a little off the beaten path, but everything that’s available on iTunes is arranged in this iMix. For the rest, reference the links with each track in the full credits below. I can only assume that all of the prints and rights were listed as assets in this agreement. Does this mean some bank has taken over rights of these titles? Will they suddenly be listed as part of a future auction like so many of the empty condos that occupy our cities? And if so whose hands will these end up in? And really where are the Scorseses in this mess? Where are the Tarantinos? Hollywood just had one of its most glorious months ever. Are these people really interested in cinema? Granted many of their email boxes must be full of messages these days reading, “desperate film organization/company in need of help”! So much so that it probably appears as often as a solicitation from some African dissident looking for a secure off-shore bank account. But has our business has fallen so low that it can’t recover? And if so is the internet i.e. free downloads, as per the daily emails from Matt Dentler at his newly found Cinetic Media post, really be the future? And if so what are we really in this game for? For certainly the cinema was meant to be seen in a cinema, a public setting, with people, sharing a dark room having a shared experience. That is why so many filmmakers started making films. Yes to get their work seen, yes to engage an audience. But the cinema was first experienced not in some virtual world but as part of cafe culture. The Lumieres after all screened their films in a cafe before a public who was not just fascinated by the experience of seeing a moving image, but also by the conversations that followed with complete strangers about the experience they just had. That experience mutated into cinematheques and community theatres where strangers met to engage the moving image and continue the conversations that ultimately forged the future of the history of cinema. Conversations that still guide viewers, both filmmakers and filmgoers alike, both in the real and yes sometimes virtually, watching in dark rooms as light flickers upon a large white screen inspiring new conversations, inspiring new films, inspiring life. The death of New Yorker is just part of the recent destruction of American cinema culture further deteriorating what makes cinema vital to life, vital to culture, vital to society. It provided a lifeline to the public, community engagement of cinema. Where then is the bail out for New Yorker Films? A company who has arguably done as much for America as General Motors or JP Morgan. Some may call this hyperbole but in all honesty New Yorker Films is as vital to our existence as the interstate highway system. Perhaps more aptly the side road, the scenic byway. It feeds so much of our foreign cinema screen time that this loss is the equivalent of tsunami wiping out the architectural history, the foundation that has built our cinemas society. And yes we can see still these films on the web. However, if cinema moves itself to a virtual world exclusively it is no longer the living breathing art form that we have all grown to love. It is dead upon arrival. No more linegring conversations. No more discoveries of our neighbors around the corner, our neighbors from our same apartment buildings, who also experienced and quite enjoyed this byway. We are in a room. Alone staring at a screen. Secluded apartments. Seculuded screens. Perhaps it is fitting then that this weeks nearly digital only release is entitled MUST READ AFTER MY DEATH. A good epitaph for the culture that has been the back bone of my own upbringing for the last 15+ years. Will Three Monkeys be the last release to hit Seattle screens from one of the US’ most important film distributors New Yorker Films? The answer may very well be yes. It was announced today that the nations foremost distributor of foreign language films will shutter its doors. It appears as though that the end is imminent. Who knows what this means for THREE MONKEYS screening here in Seattle. A distributor whose work was championed in retrospective back in 1987 well before it was fashionable a few years ago, this label will certainly be missed. The big question is what will happen to its massive archives, which includes films from Ackerman, Bertolucci, Bresson, Chabrol, Fassbinder, Fellini, Godard, Herzog, Kieslowski, Malle, Rohmer, Rossellini, Sembene, Wenders, Schlondorff, and many others, and who do we start working with to clear rights for these titles for future retrospectives? This following the word on the possible eviction of Filmmakers Co-op is just the latest in a series of very disturbing events that threatens the life line of cinema in this country. Now later — at 3:00 PM — by popular demand! at the Northwest Film Forum – 1515 12th Ave.
An old-fashioned weekend matinee — with cartoons and shorts, a thrilling 12-chapter movie serial, and a great Secret Feature. Watch for updates at http://sprocketsociety.org/secret/ or subscribe to the series Twitter feed at http://www.twitter.com/SecretMatinee to get secret clues, streaming video teasers, and maybe a chance to win some free tickets. Our all-classic line up of Secret Features will (mostly) follow Zorro’s lead, with adventure, intrigue, tough guys, and westerns — plus some curveballs just for yuks. They date from the 1920s through the 1950s, with one lone late-’60s straggler. First up on March 1: Randolph Scott finds himself taken captive during a stage hold-up gone wrong, in one of the best westerns of the ’50s. No repeats from the last series…well, except for one feature too perfect not to show. Everything else is brand old! All shown on 16mm with a 1,000 watt theatrical projector! Posted in Uncategorized | Comments Off on Secret Matinees return! Lynn Shelton (We Go Way Back, My Effortless Brilliance, Humpday, etc.) just won an Independent Spirit Someone to Watch Award.